The bright, red tomato, that I shared with you, In Nature, last month, was actually picked and eaten by my oldest great-niece, much to my delight! She had finished swimming with her father and siblings, when she came into the kitchen, ready for supper. I showed her the offerings, none of which appealed to her, and asked her what she might like to eat. It did not take her a second to ask if I had any cucumbers; much to my chagrin, I did not have any cucumbers. (I shall however, take a clue from “Monica” and promise to always have cucumbers in the future.) But I remembered the tomato, and asked if she might like a tomato, mind you, this child is six years old. Her face lit up, yes she would like a tomato! We walked to the far end of the pool room, it was getting dark, but she could see the tomato, and seemed thrilled to pluck it from the plant. She then noticed the other green tomatoes, still on the vines, commenting on how many there were, and then asked about a small cluster of porcelain tomatoes, that are staked as a decoration, in the pot. After a bit, we made our way back to the kitchen, where I washed and quartered her tomato; I remember handing her the plate, her saying thank you, and watching as she made her way to an open seat, on the north side of the crowded dining room table. The festivities continued, me not giving the tomato a second thought. As the evening drew to a close, and she and I began to say our goodnights, we talked about her coming back for another swim, and she said: “and for another tomato – it was so fresh.” Yes, indeed, I said, thinking you may have all of the tomatoes you like! I was quite taken by that conversation with Miss Annaka, especially given that I had written about that tomato and the hope that gardening can bring. Being able to share the tomato with such an enthusiastic recipient, more than compensated for whatever effort or expense has gone into caring and nurturing of that plant. Hearing that she had enjoyed her tomato, so much so that she was looking forward to eating another one, absolutely fed my soul! The next day, reminiscing about the many wonders of the time shared with my family, on Sunday, I came back to that conversation with Miss Annaka; and found myself smiling. Yes, her voice, her mannerism, her sincerity, her pure cuteness was absolutely abundant and adorable; but her words: “It was so fresh” also reminded me of my Mother and her love for gardening, for fresh produce, and most especially for fresh tomatoes, tomatoes that she described eating, as a child, as if they were apples. This month, my Mother would have been 87 years old. 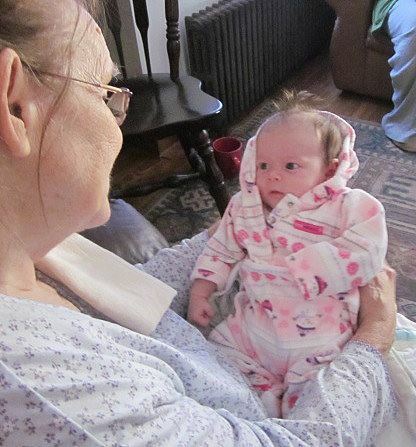 She has five great-grandchildren, and the sixth will be born this month; Miss Annaka is the oldest, and the great-grandchild that got to meet and associate with my Mother, her great-grandmother. Miss Lucy, the youngest, until her brother arrives, has started walking and is overflowing with charm and personality. Occasionally, she will exhibit this look of determination that reminds Kate and me of my Mother, and makes us both smile deeply. Gathering around the table, sharing a meal, as we celebrate my youngest niece, Mrs. Hannah’s, birthday, it is impossible not to think of my parents. Preparing for any family gathering always brings traditions to mind, as I select what music I will cook to and what foods I will prepare, and even which decorations we put up. Kate and I have been putting up our birthday cake lights, since her 21st birthday; I bought the plastic lights at Target on Bellflower Boulevard, in California, in what was a new store to me, at the time. I paid five dollars for the lights, which was a huge investment, (I think I was making 3.35 an hour, so I had to work four hours to pay for the indulgence) ; and I bought two strands, both of which I still have! In thirty one years, we have never skipped putting up the birthday lights; I even took them to Puerto Rico with us, the year we happened to be there for Kate’s birthday. Now, we put them up not only to celebrate each other’s birthdays, but for my Sisters, Brother-in-law, Nieces, Nephew-in-law, and great Nieces and Nephews; the lights are not a tradition from my childhood, but rather from my adulthood that I get to pass on to the children in my life, whom perhaps too will develop this tradition of plastic cake lights. Life comes in cycles, and at whatever point we find ourselves, in that every moving and uncontrollable cycle, we need to remember to celebrate the moment and rejoice. I hate not being able to celebrate my Mother’s birthday, but I can continue to celebrate my Mother, thus I make my way to the laundry room, to take down my garden caddy. At the very least, I think to myself, I am going to make sure the tomato plants are well staked, and maybe do a bit of top dressing and feeding, as well as give them a drink of water – I am going to need at least one bright red tomato ready to be harvested, when Miss Annaka returns. That Is All For Now. This entry was posted on March 1, 2018 at 12:14 am and is filed under From the Editor, LeftSide. You can follow any responses to this entry through the RSS 2.0 feed.